There are many seasonal events taking place all over Japan. 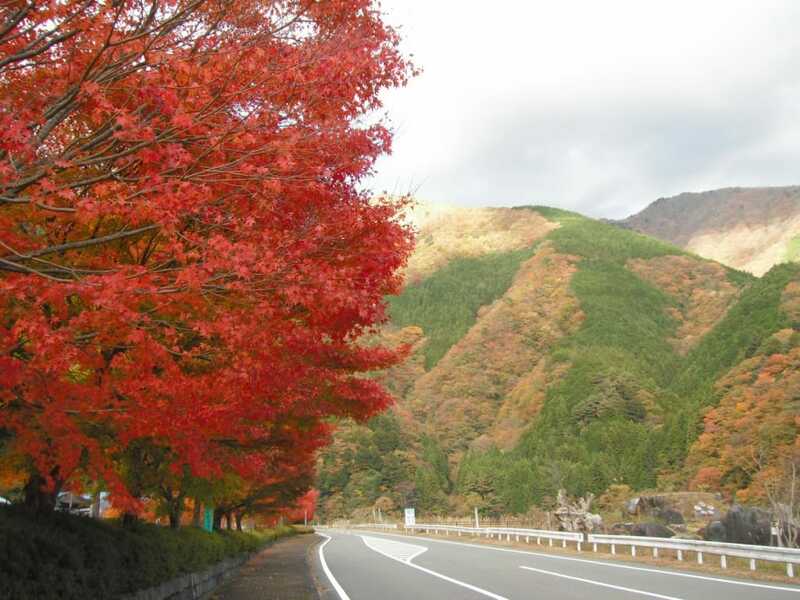 Especially, Tokai area where there are few famous sightseeing spots: Atami and Nagoya, you can enjoy beautiful autumn nature scenery with coloured leaves. In this article, you can read about popular events in November around Toukai area, if you are visiting this area in this month, this article would be great read! 1. 【Shizuoka】Autumn Atami Seaside Fireworks Display 2017.11.12. Autumn Atami Seaside Fireworks Display is taking place Atami bay, Atami, Shizuoka. This fireworks display is special because you can feel as if you are in a big stadium watching it. Atami bay is surrounded by mountains therefore, all the sound of explosions echo which add more dynamic to the whole experience. Obviously, the fireworks would be incredible. Daikuuchunaiagara is the most beautiful one thus you shall not miss it. Daikuuchunaiagara would be the last one to go up in the air; you would know it by the night sky turning white for a second. If you are in Atami in November, you should watch this display. ※ Autumn Atami Seaside Fireworks Display is happening year around, if you want to see other dates apart from November, please check them on official website. time from main station：from Shizuoka station: take Toukaido Sanyo Shinkansen Hikari about 40 min / From Tokyo Station take Toukaido Sanyo Shinkansen Hikari and bus, then walk 1 min. entrance fee：there are paying seating area which is 1000yen. You can book it in advance. booking：you do not need to make booking in advance. Autumn Festa is taking place at Hamanako garden park, Hamamatsu, Shizuoka. The main focus of this event would be the flower display of Cosmos. There are three different sections: Hanahiroba, Hana Bijutsuka and KokusaiTeien. You can see different types of flower Cosmos in each section. You would not want to miss Hanahiroba because you can see colourful display of four hundred thousand Cosmos. If you see this display from the observation point of the park, you can see this display is actually a giant flower picture as well. You shall visit the observation point to do so. At Hananobijutsukan, you can walk thorough an arch made by Cosmos. At Kokusaiteien, you can hop on to a cruise ship to see flowers. You can enjoy Cosmos in many different ways that is what this event all about. Genjinosato in Fukuroi, Shizuoka, Japan, you can see sunflowers in autumn. Genjinosato used to be rice fields, but they were not in operation for while. Fukuroi council renovated the area in order to bring more tourists. Genjinosato is about 3 hectare; about one million sunflowers are planted there. The reason they are blooming during autumn would be that they plant them during summer. Flowers are much smaller than summer sunflowers but their gorgeous blooming are still enjoyable to. Their sunflowers are not all ordinary. One is Teddy Bear which looks like dandelion and another one is Moulin Rouge whose petal is black. It’s quite spectacular to be surrounded by so many sunflowers in a large open space. You shall visit the place and experience Japanese autumn feeling. At the valley Myoujinkyo, Tenryu, Hamamatsu, Shizuoka, you can see change of autumn leaves. This is one of the best places to see autumn leaves in Japan. The valley Myoujinkyo is located between Harunomachikatsusaka and Ketawawa. It’s a river valley and there are huge rocks around. The leaves are coming out on top of them. This Myoujinkyo autumn leaves create breath-taking sight, giving out beautiful vivid colours that stop you from walking away. The upper part of the river and the lower part would are different colours that would make this more special place to visit. Myoujinkyo is must visit place during this season, it gives different views to enjoy in a single visit. Umegashima hot spring is in Aoi, Shizuoka, Shizuoka. This hidden gem hot spring offers great autumn leave sight as Myoujinkyo. There are many waterfalls around Umegashima hot spring. Abenoohtaki and Sandannotaki are the most famous amongst them. Abenoohtaki is one of the well-known waterfalls in Japan. Sandannotaki has three levels of waterfall, they are known for its beauty. Those waterfalls become more astonishing sites to visit with autumn leaves around them to add bright colours. You can drive around your car to enjoy from your car. Mt Fuji skyline is a name of road that takes you to entrance point to climb Mt Fuji. This is 26 km road and it has a wide range of altitude from 600m to 2400m. There are Japanese larches trees and maple trees along side of the road. They are conifer trees and known for its beauty of their autumn leaves. 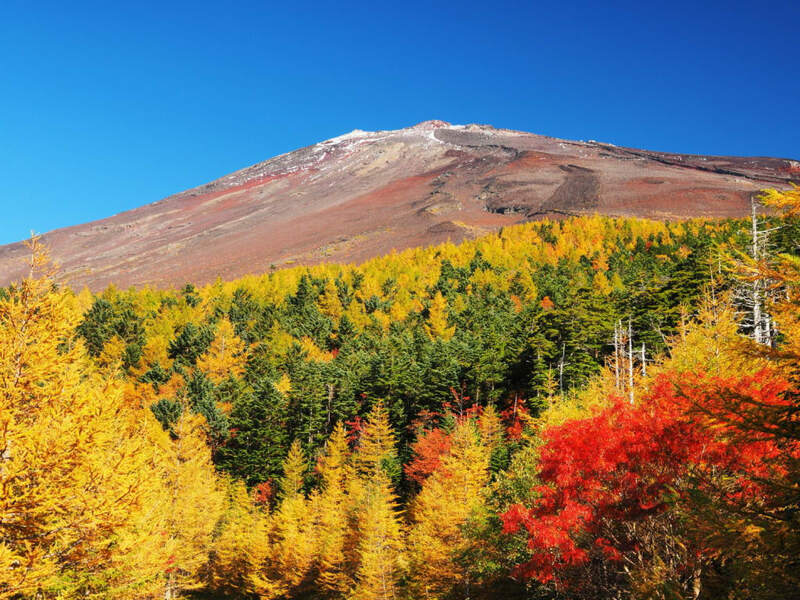 Surely you can see Mt Fuji from the road, the view of this iconic mountain with autumn leaves is something very special. You can enjoy this from you car by driving just like Umegashima hot spring. Handa city marathon is taking place in Handa, Aichi, Japan. This marathon started 35 years ago as Handa shimin marathon. But this year makes 80th anniversary year Handa city so they rename as Handa city marathon. This marathon is very unique because runners are allowed to dress up in costumes. You can see many runners with interesting outfits. The audience would cheer runners by putting on red groves. If you go to a specific area, you can high five runners which is a unique experience. 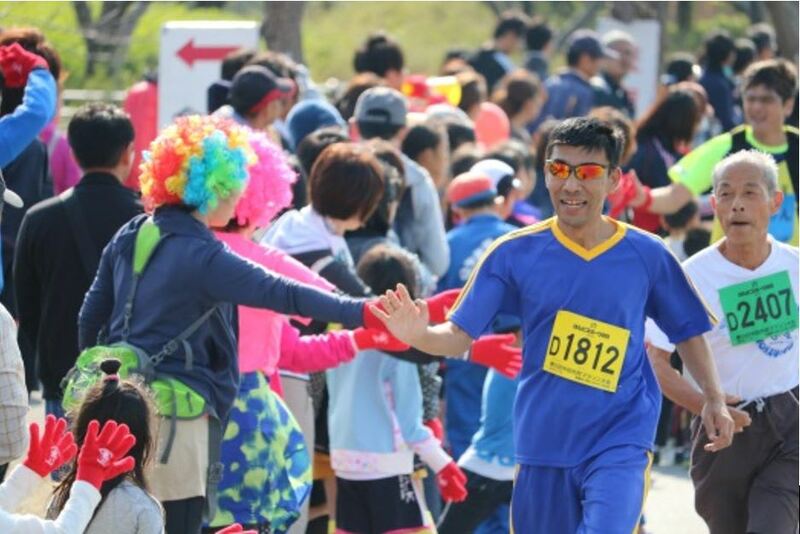 Handa city marathon offers a bit of audience participation that makes it an interesting sports event you shall visit. time from nearest station：from Chitahanda station take bus Nichiitayama abut 15 min then walk about 20 min. Tokinosumika resort is located in Gotenbakougen, Gotenba, Shizuoka, Japan. The resort has a hot spring and hotels. This resort has a special illumination event during autumn season, which is called Hikarinosumika Tokinosumika illumination. You shall visit all sections of illumination, to see the difference! This is a much-loved event by kids. Visitors can be train drivers, or train cleaners and they can actually do some real work experience. You can collect some stamps and get a gift from Enshutetsudo. Moreover, there is a pre-event, Train festa chokuzen event. You visit Shinhamamatsu. Hikuma and Nishikajima station and collect stamps. Then you would get a chance do a lucky dip at the actual event and could get a present. If you are travelling with children, you shall attend this pre-event. You can enjoy the actual event much more. important information： You need to get Akaden 1 day travel card and a stamp card in order to collect stamps at Shinhamamatsu, Hikuma, and Nishikashima station. time from main station ：from Shizuoka station take JR Shinkansen Hikari 19 min, at Hamamatsu station change to Enshutetsudou about 33 min.